I love Onigiri. I was introduced to them at a japanese restaurant in town when I was in highschool. 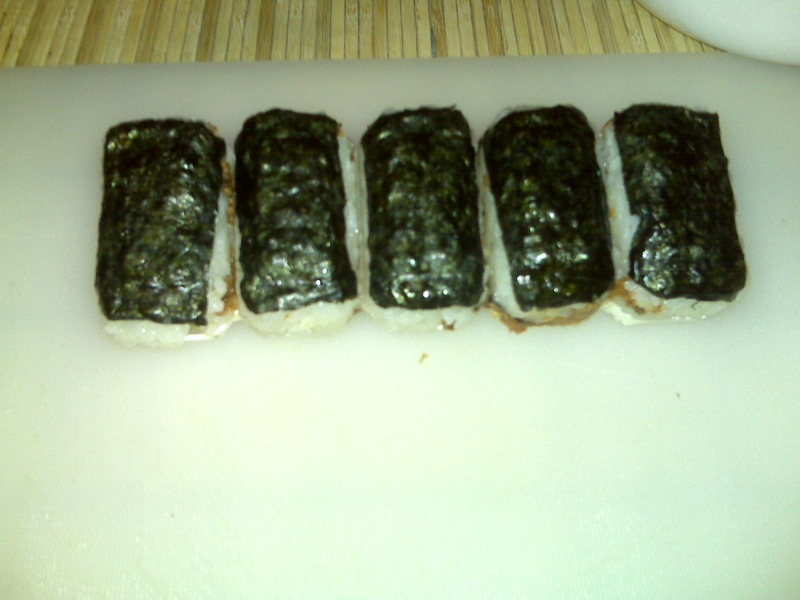 They can also be called Musubi or Omusubi, generally they are a molded rice ball that has been stuffed. Traditionally, an onigiri is filled with pickled ume, salted salmon, katsuobushi, kombu, tarako, or any other salty or sour ingredient as a preservative. They are often included in picnic lunches, they are seen as an easy kind of take out food. In fact a good deal of convenience stores in japan will have a variety of onigiri available. If you search the internet you will see just how adorable some of these onigiri can be made to look…and they are so delicious!! 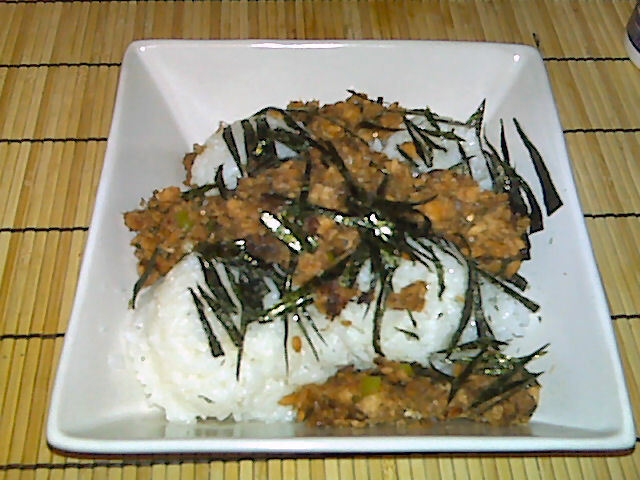 I have made up my own version of an onigiri, it is by no means traditional but it certainly does the trick now that I am far from that restaurant. Heat a pan to medium and swirl in the oil when it has reached heat. Add the shalots and stirfry briefly until softened. About 2 minutes. Add the salmon and break it up. Add the hoisin, soy sauce, and oyster sauce. Stirfry until liquid is soaked up and salmon is slightly caramelized. About 2 minutes. For the rice I typically use a steamer or rice cooker. A stovetop method that has been good for me has been to add 2 cups and 2 tsp of water to the rice. Allow to come to a boil, then lower to simmer, cover. After about 15-20 minutes. Remove from heat, cover with a tea towel under the cover and allow to steam for another 15-20 minutes. Combine the rice wine vinegar, sugar and salt. Stir until solids are dissolved. Pour the mixture over the rice and stir in carefully, allow to cool until able to handle. To assemble: place the nori in the rice mold, top with some rice, top the rice with some salmon mix in a bunch in the center, top with a bit more rice, and then press down with the top of the rice mold. You will learn the ratios that work best with your particular rice mold. What delicious little tidbits these are. They can be very impressive as a little snack at parties or delightful for dinner or at a little picnic. We enjoy two different dipping sauces with these, either wasabi and soy sauce or kewpie mayo mixed with some chili garlic sauce. Kewpie is that bottle of mayo you see in the asian section of your supermarket that has a little kewpie looking doll on the side of it. I love to use it for all my asian cooking that needs a bit of mayo. This batch I was able to make 30 onigiri. Each one was 56 calories, 1.5 grams of fat, and 0.4 grams fiber. Sometime in the future I plan to try making these with brown sushi rice but I haven’t been able to brave it yet. If you don’t have a rice mold or are too lazy to mold them do not despair! Just make it into zushi instead. I use the same recipe on my salmon and rice for my zushi bowl. Then I just snip the nori so that it falls artfully on top. So easy! Yup, two dishes for the price of one today and that’s no foolin’. If you decide to do zushi instead you should be able to get four servings out of that at 420 calories, 11.5 grams of fat, and 3.1 grams of fiber per serving. Still not bad at all considering that includes the rice! When I do zushi I pair it with a nice salad with my homemade ginger soy dressing. This entry was posted in Dinner, Lunch, Snack and tagged salmon. Bookmark the permalink.